Sunroom Additions Peoria, IL | Kelley Construction Contractors, Inc.
Live like royalty with a new, energy-efficient room addition or sunroom from Kelley Construction Contractors, Inc. Neighbors will envy your enjoyment of the sun from the comfort of your brand new addition. Will it be a quiet escape? Perhaps a painting room? There’s endless potential with these flexible, durable, and gorgeous additions from Kelley. Each one is backed by a limited Lifetime Guarantee. You may hear various terms for sunrooms thrown around, including three seasons room, all seasons room, screen room, and more. While all of these point to the same general idea, they each have their own unique features. 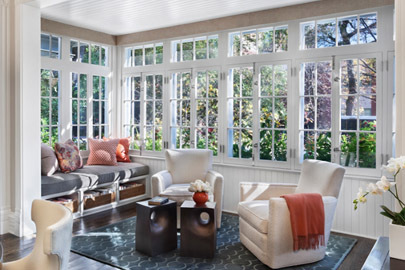 Learn more about the various types of sunrooms to decide which one is best for your property. Still not sure which will best suit your property? No problem. Call us and we are happy to work with you on something that fits your style and budget. Why hire a professional for your sunroom addition? Getting a new sunroom requires special attention that only professionals are used to. It certainly isn’t as easy as just buying a sunroom kit and attaching it to your property. Local zoning restrictions are a big consideration before beginning any work on your new addition. HVAC systems must also be considered — whether or not current systems are large enough to account for the addition. Other considerations include windows, skylights and the ways in which the room will be used. All of these considerations can be confusing and stressful, but they don’t need to be. Let the professional contractors Kelley Construction Contractors, Inc. handle all of these considerations and the construction of your new sunroom. Contact us today to get started!